Cool! I don't think I've ever seen the Salsa in any store -- do you know if anyone's using them yet? The other new type of cart I've been seeing in several stores, mostly ShopRites, looks like this: https://www.flickr.com/photos/142408586@N05/26753341283 I don't know who makes it, though. The cart you showed is made by Bemis Retail Solutions, which is also the toilet company for most retail companies. I contacted Technibilt, the maker of the Salsa, about the release/production date, and it sounds like it might just be a concept for now. Whenever I requested a quote, they swayed me over to the Renaissance (shown above), which I felt was odd, considering you can build your own Salsa cart on their website. Interesting! That is kind of strange, too, about the Salsa. Honestly it looks like it doesn't have too much load capacity for a fairly sizable cart, but it also looks like it comes in different sizes. In my opinion, these are among the worst shopping carts. They just look and feel so cheap. I have to agree. 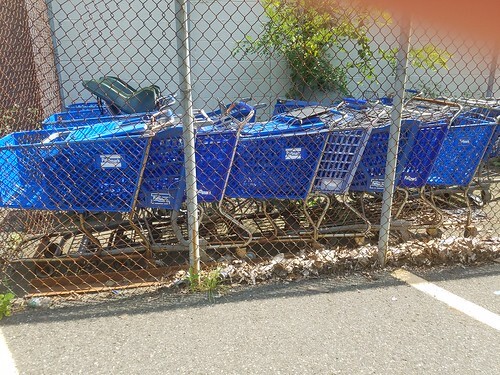 I personally like metal shopping carts more for the fact that the general upkeep and maintenance of the cart is easier, and won't get completely faded or chipped if it's left out in the sun. They last a lot longer too! It's funny, because I was reading Google reviews of a Stop & Shop in NYC that was formerly a Pathmark, and people kept saying "I miss the plastic carts", because apparently there were items that were easier to stand inside of the cart? I've never had that problem, what about you?